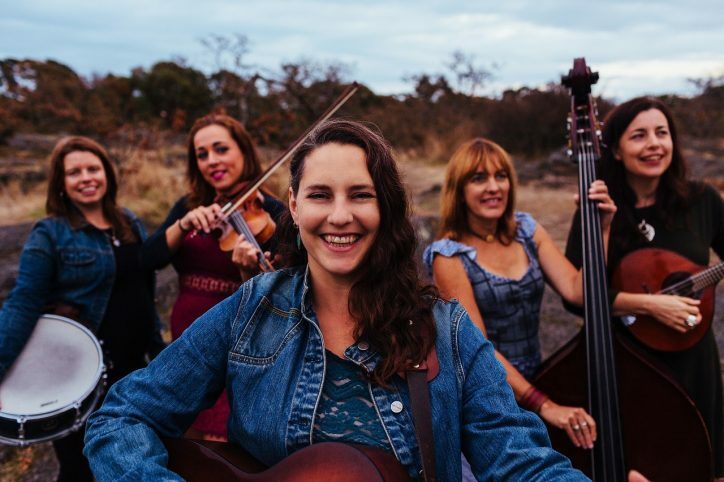 Soaring harmonies, catchy original songs, foot-stomping fiddling: Genevieve and the Wild Sundays is an all-female quintet that feature the award-winning songs of Vancouver-Island homesteading, guitar playing mama Genevieve Charbonneau . With songs that run from insightful love ballads to rollicking political hootenannies, the music of the Wild Sundays is rooted in old-time country, incorporating Eastern European folk, Americana, and indi-pop. Genevieve began crafting tales of love, loss and rural living while homesteading in the Cowichan Valley, in between raising her three sons, harvesting veggies from the garden and hauling firewood to fuel her earthen home. In 2013, longing for vocal harmonies and instrumentation for her songs, she brought together long-time bluegrasser and fellow Balkan Babe Kelly Sherwin, vocalist/percussionist Laura Carleton, and Yiddish Columbia State Orchestra’s mandolin player Chandra Crowe to create the Wild Sundays. Five time North American fiddle champion Ivonne Hernandez joined in July 2016, bringing her virtuosic prowess to the band. This package delivers a powerful and engaging live show, with songs that will stir your heart one moment, make you laugh the next, and wow you with dazzling instrumentation and spitfire lyrics. Genevieve’s debut album “Updraft” garnered a Producer of the Year Award for Marc Atkinson, and her song “Farmer Ain’t in the Dell” was nominated for Country Recording of the Year at the 2014 Vancouver Island Music Awards. Genevieve’s song “Down Down Down” was an 2017 International Acoustic Music Award finalist. Genevieve and the Wild Sundays have graced stages at Rifflandia, the Islands Folk Festival, and Butchart Gardens and have toured the west coast.